While gift bags haven’t exactly stomped out traditional wrapping paper, they’ve taken much of the personal out of wrapping presents. However, if you’ve got a wide circle of friends and family, it’s often cost prohibitive to shop the chichi gift-wrapping emporia. But it’s still possible to devise and design unique wrapping schemes without going broke. Look around the house for paper shopping bags, even the brown ones, fabric remnants, and even the Sunday funny papers. Giving a get-well gift? You can even use band-aids for tape. Paper towel bows, old utensils and cloth napkins – you’re limited only by your own creativity. Repurposing household goods makes for amusing, quirky wrapping that will please you and the gift’s recipient. If you just have to do the new but can’t afford boutique prices, try shopping at craft stores like Michaels and fabric shops like Joann for bits and bobs that add special flavor to your packages. Start on the sale aisle and look for deep discounts on ribbon, silk flowers and greenery, paper ornaments, stamps and decals. A little bit of money goes a long way when you’re dealing with 70%-off and higher. You’ll do yourself a big favor by shopping after-holiday sales. Who knows, that Easter grass and those plastic eggs might be just what you need to wrap the next baby gift. Also, shop your favorite holiday sales the hardest, and add little touches to package wrapping that say a gift is from you even without your name on the tag. Stores such as Party City, The Party Shop, Shindigz and Party Value, are another great way to find classy wrapping elements for next to nothing. Especially if you’re into theming, look forward to big color, high design and interesting and sometimes surprisingly durable, materials. Add some balloons to your craft bag along with confetti and streamers for awesome wraps that look like you spent a fortune. If you’re more a traditionalist when it comes to wrapping presents, you’ll be very pleasantly surprised at what Dollar General, Dollar Tree and Family Dollar can do your budget. 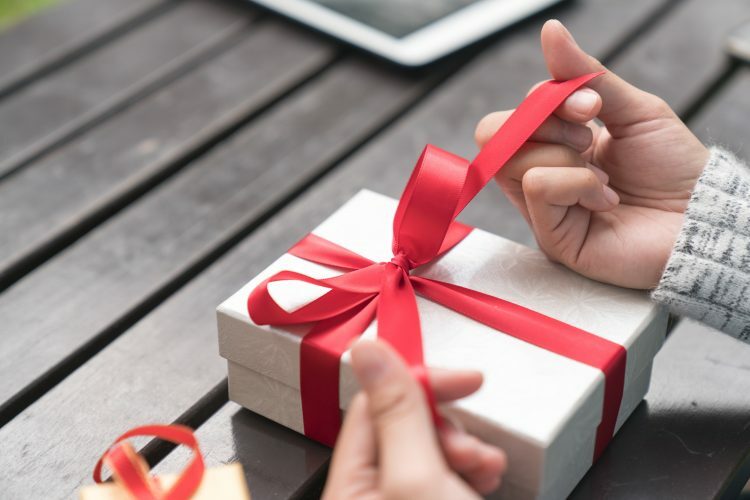 In addition to tiny, quirky toys and ornaments that you can get for pennies, these stores offer a surprising range of wrapping paper, ribbons, gift boxes and crafting supplies. In particular, Dollar Tree – where nothing is over one dollar – will titillate your imagination with seasonal offerings as well as their everyday wares. A five-dollar shopping trip can net you a entire roll of way cool wrapping paper, yards of ribbon in rainbow colors, tissue paper and even tape. Look here first to find regulation boxes and themed sets that include tablecloths, plates and napkins; everything you’ll need to wrap presents and throw a party. Or experiment with what “box” means with glassware and color plastics, where at most you’re out a buck. Learn more about decorating and decor on iRazoo.com.